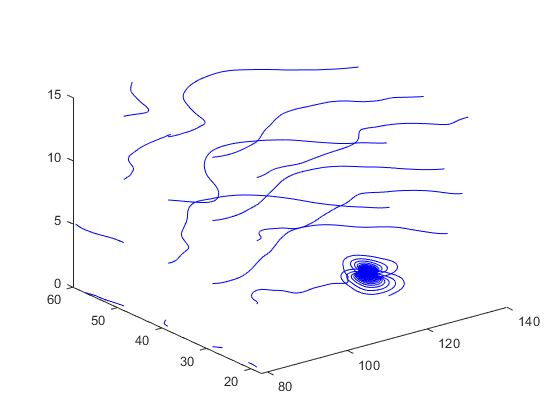 XYZ = stream3(X,Y,Z,U,V,W,startx,starty,startz) computes streamlines from vector data U, V, W.
startx, starty, and startz define the starting positions of the streamlines. The returned value XYZ contains a cell array of vertex arrays. XYZ = stream3(U,V,W,startx,starty,startz) assumes the arrays X, Y, and Z are defined as [X,Y,Z] = meshgrid(1:N,1:M,1:P) where [M,N,P] = size(U). Use the streamline command to plot the data returned by stream3. Plot 3-D streamlines from data representing air currents over regions of North America.